Any one that speaks to me more than a couple of paragraphs essentially knows I love my Mama. I am a Mama’s girl through and through. 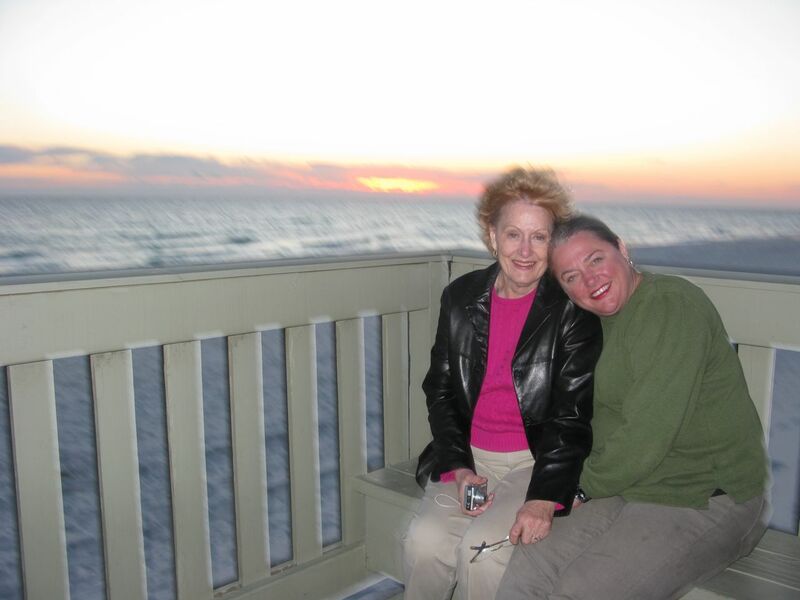 Mama and I have always been very good friends. Strawberries are the most popular berry fruit in the world, and while they are available in grocery stores every week of the year, spring is their true season. (Technically, strawberries aren’t actually a fruit or a berry; they are instead the “enlarged receptacle of the strawberry flower.”) Regardless of the correct botanical terminology, strawberries are a most welcome salute to spring! Their bright red bursts of color and flavor are refreshing after the winter months of apples, pears, and citrus. Although you can get seasonal strawberries grown in Florida and California, there’s nothing better than picking your own fully ripe berries or picking up farm fresh berries at your local farmer’s market. Choose strawberries that have a good aroma and sweet fragrance. When ripe, the color of strawberry varieties can vary from a more medium red to deep red, so color is not always the best indicator. However, since they do not ripen after being picked, only choose strawberries that are fully red without any creamy white or pale green, with fresh-looking caps and perky green leaves. Health-wise, strawberries are fantastic with a good amount of fiber and more vitamin C than any other berry. Topped with a spoonful of plain yogurt, they are a sweet-tart, wonderful, and delicious way to start your day. I’m not a fan of cooked strawberries (except in jam) so I prefer them as bright and clean bursts of flavor in salads or tossed in vinegar as a fruity salsa. However, we all have destiny, I believe. And, to me there’s no doubt that strawberries shine their brightest in dessert. This Strawberry Semi-freddo was created by my dear friend and colleague Tamie Cook. It’s a creamy, indulgent, and awesome spring fling. Strawberries and cream are classic decadence. For some Down-Home Comfort, please also take a look at FoodNetwork.com for my golden brown and incredibly tender Brown Sugar Strawberry Shortcakes. Absolutely nothing beats the taste of real whipped cream so just leave the non-dairy topping in the fridge for both desserts. You know, yogurt is virtuous and yes, even delicious, but fresh strawberries and cream are simply divine. When I was 18 I spent the summer in London. That summer I thought I was especially grown up, living abroad and galavanting all over London. I had heard about the beauty of Kew, the Royal Botanic Gardens, and planned a visit. It was a few train rides away and off the normal metro line, but I managed to find my way there — all by myself. (I only want to add London England is a long, long ways from the red dirt roads of South Georgia.) Just before entering the majestic splendor, I popped into a grocer and purchased a pint of strawberries and a small glass bottle of clotted cream. It was a Anglophile’s dream date and I wanted a special private picnic for my solo garden tour. I was grinning like a Cheshire cat at the combination of my sophisticated sojourn and the very British bites I had in store. Yet, after the shop, I found myself at the gate without enough money to enter the gardens. I was scared I wouldn’t have enough money to get back home. So, I sat down on the bench by the gate and gazed through at the amazing beauty within the ornate iron gates. I remember thinking to myself what a silly little girl I had been, but I loved every mouthful of strawberries and cream none-the-less. When whipping cream it is very important the cream be well chilled as well as the bowl and the beaters. (Cream simply will not whip if it is warm.) For best results, make sure to use cream that has either a 36 to 40 percent milk-fat content (heavy cream) or 30 to 36 percent (light whipping cream). Lastly, don’t over-whip the cream – it turns to butter. On that note, you won’t find either dessert in my next cookbook, Lighten Up, Y’all (spring 2015), but this book is all about saying YES! not saying no. You can have enjoy indulgent desserts – just not every day, not without moderation, and not without putting in an extra bit of exercise. So, enjoy! Along with strawberries, spring has brought about a bit of spring cleaning. Please check out my new website, www.virginiawillis.com. I’m thrilled with the design and technology. It’s responsive to smart phone, tablet, or computer screen. Pretty cool stuff and great job by IdeaLand and Pixie Wizard Graphixs. I am so thankful to work with such a great team. Stay posted for big changes on my blog, too. Lots of new comings and goings on the horizon. Thanks so much for reading! Place a large saucepan with 2-inches of water over high heat. Bring the water to a boil then reduce the heat to maintain a simmer. Whisk the eggs, sugar and salt together in a medium mixing bowl. Set the bowl atop the simmering saucepan, making sure the bottom of the bowl does not touch the water.Whisk constantly, over the heat, until the mixture reaches 170° degrees F and has thickened slightly, about 5 minutes. Remove the bowl from the heat, add the strawberry puree and whisk until combined. If necessary, refrigerate until cooled to room temperature. Whip the cream in a large mixing bowl until medium peaks form.Fold whipped cream into strawberry mixture until well combined. Transfer to molds and freeze until firm, at least 6 hours. Unmold and serve with fresh strawberries. Please be nice. Unauthorized use and/or duplication of this material without permission is prohibited. Feel free to excerpt and link, just give credit where credit is due and send folks to my website, virginiawillis.com. Thanks so much. Want to keep up with my culinary wanderings and wonderings? Lets connect on Facebook , Twitter, Instagram, and Pinterest. Copyright © 2014 Virginia Willis Culinary Enterprises, Inc. These deviled eggs are amazing. It’s very important to puree the yolk mixture completely, and really I prefer using a sieve or tamis. This prevents lumps and makes the mixture so much smoother as well as prettier. This is another one of those recipes that there are very few ingredients which makes the technique is so important. 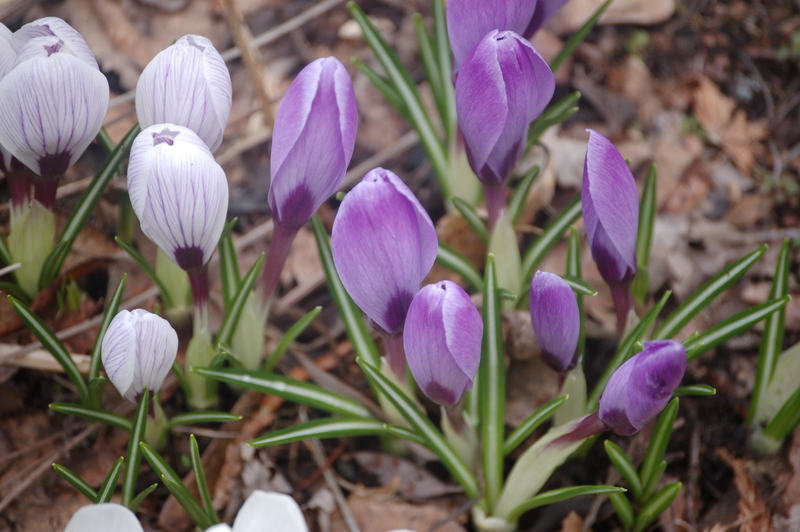 In honor of long-awaited spring, I thought I would share a few photos I’ve recently taken of lovely flowers. 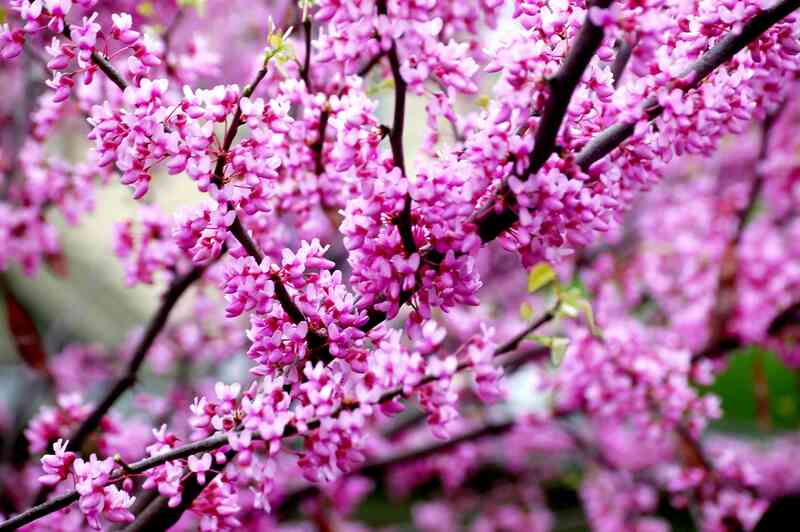 After our long, harsh winter, it’s so nice to see these vibrant bursts of color. 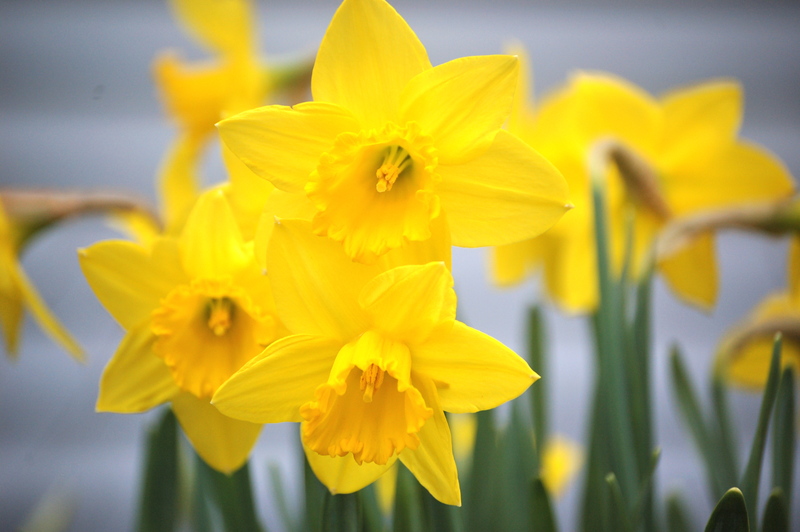 The words “the birth of spring” are trite and over-used this time of year. It’s certainly not great writing — but doesn’t that sound just about perfect when you look at these amazing miracles of nature? 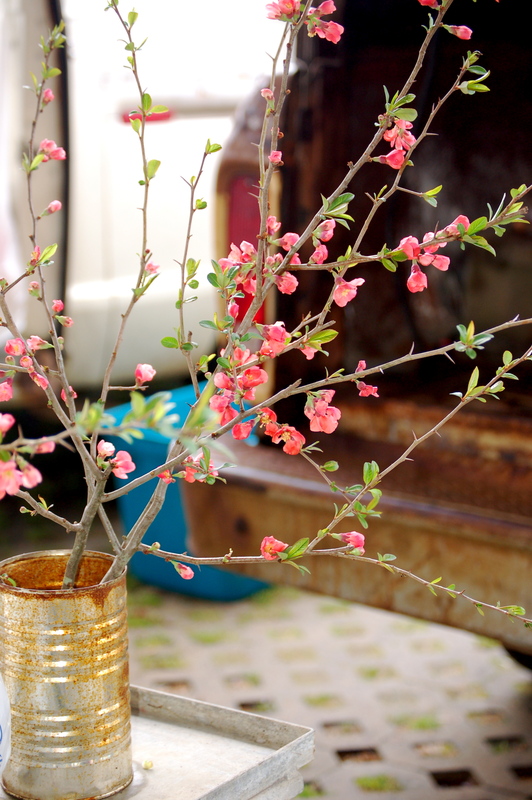 If you need a spring recipe to accompany your spring flowers, please make sure to check out my column Down-Home Comfort on Food Network. Please keep up with me on Facebook , Twitter, Instagram, and Pinterest. I’ve got a stack of books I’m in love with and can’t wait to share with you – Summerland by Anne Quatrano, Cooking Light’s Global Kitchen by Dave Joachim, Latin American Street Food by Sandra Gutierrez, just to name a few….But, my friends, I’m on deadline for my next book with Ten Speed Press, titled Lighten Up, Y’all. It’s due March 17 and I have to stay super focused. So, this is more of a catch-up than a proper post. Testing has been going really great – I am loving the recipes, as are my guinea pigs. How about a Lightened Up Cream Cheese Brownies, Macaroni and Cheese, AND Old-Fashioned Pot Roast?! I’m especially excited because I requested this next book to be paperback — and less than $25. I want people to cook from my books and want this one to be as accessible as possible. It will have 100 recipes and over 75 extraordinary photographs by my dear friend, the beautiful and talented Angie Mosier. There’s been a good bit going on — I’m working with IdeaLand and Pixie Wizard on a new website that will be AWESOME. I’m thrilled with their work so if you need someone to work on your corner of the web, make sure to check them out. The big news is that Down-Home Comfort on FoodNetwork.com is a BIG success. I’m heading into a photo shoot for the summer Down-Home Comfort posts as soon as my manuscript is finished. 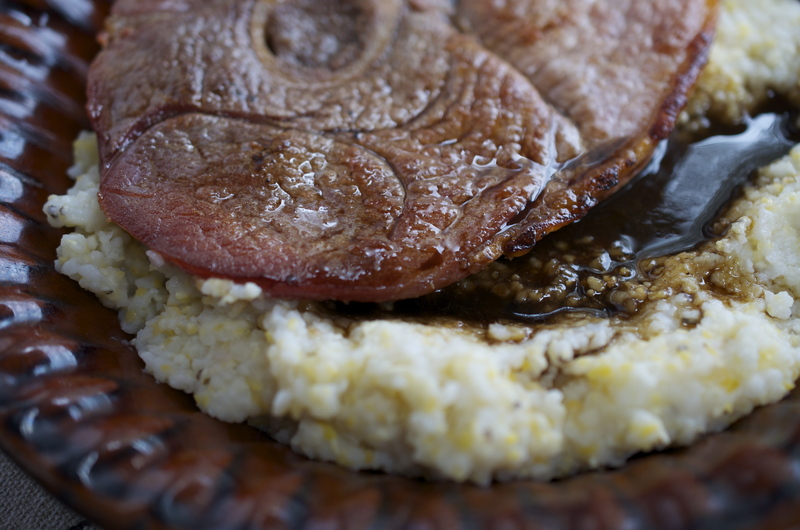 This week I am sharing a recipe for Stone-ground Grits with Country Ham and Red Eye Gravy. So, please forgive the sound of crickets from my own blog — and in the meanwhile, please follow Down-Home Comfort on FoodNetwork.com — and, help a sister out – please like, pin, share, and tweet! Keep up with me on Facebook , Twitter, and Pinterest. Atlanta got hit with 2-inches of snow and the world stopped. Literally. For 18-hours. It’s been all over the national news and everyone is in disbelief. 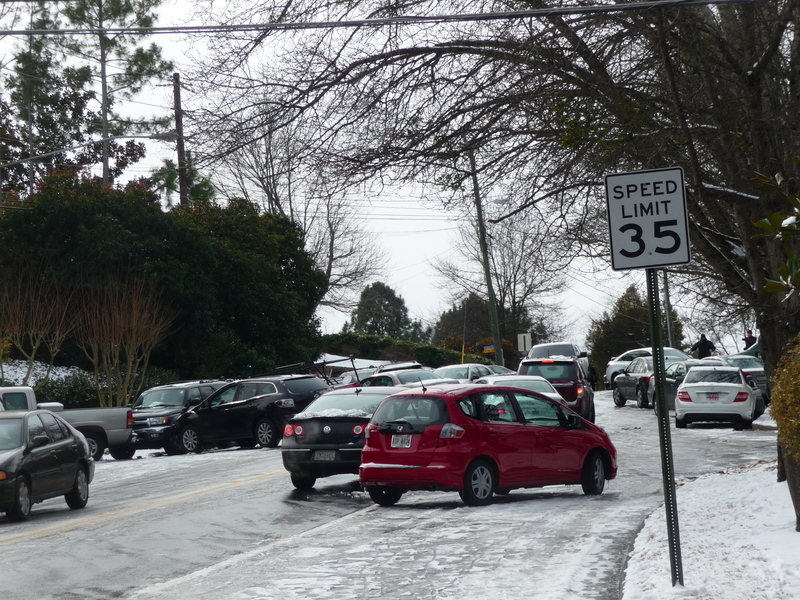 If you you think it’s as simple as Southerners not being able to drive in the snow – you’re wrong…. 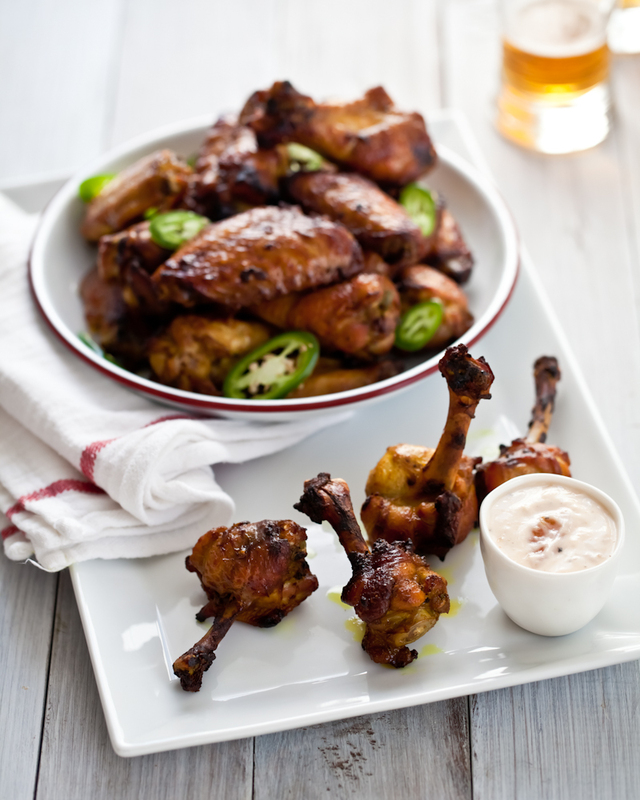 However, I am not here to talk about politics, I am here to get you to cook and this week I’m heating things up with one of my favorite wing recipes, Curried Wings with Peach Dipping Sauce. This photo was on the main street in my neighborhood, not technically within the city limits of Atlanta. Before I start winging it, I want to let you know I am featuring Pimento Cheese and Crab Dip in my Food Network column Down-home Comfort that will pop up online on Friday, so stay tuned for those recipes for your Superbowl party. (You can sign up for the column RSS feed here.) Today, I am sharing with you one of my favorite recipes for Curried Chicken Wings that I am certain you will love – they are lip-smacking, finger-licking good. Madras curry is a fairly hot curry blend, most often deep red from a heavy amount of powdered chile. Oddly enough, for a region that until recently considered any flavor other than bacon fat to be exotic, there is a history of curry in the South, which entered our region through the seaports of Savannah and Charleston. To prepare the chicken wings, cut off the wing tips (reserve to make stock), and halve the wings at the joint. In a large bowl, combine the wings, curry powder, turmeric, cayenne, soy sauce, canola oil, jalapeños, garlic, salt, and pepper. Toss to coat. Cover and refrigerate for at least 1 hour, or overnight. Meanwhile, to make the sauce, combine the yogurt, preserves, and hot sauce. Season with salt and pepper. Cover and refrigerate until serving. Remove the marinated wings from the refrigerator and let come to room temperature. Taste the yogurt dipping sauce and adjust for seasoning with salt and pepper. Garnish with cilantro and serve the hot wings with the dipping sauce on the side. Wintery mix and snowy weather call for cozy, comforting foods. 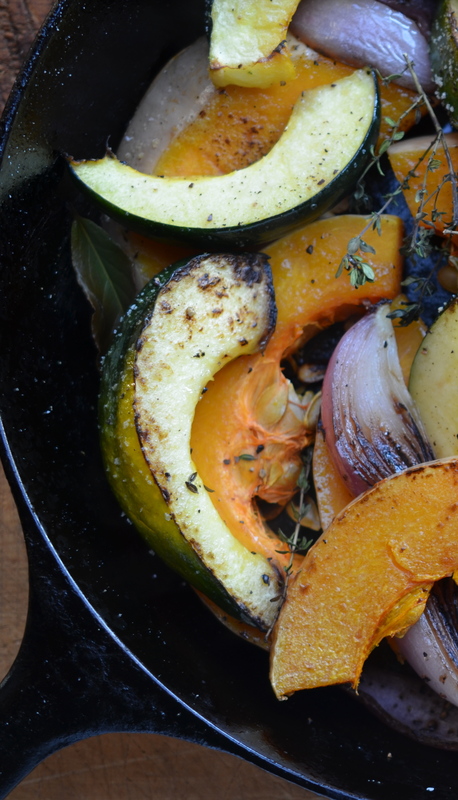 One of my absolute favorite recipes when I was a little girl was Roast Acorn Squash. Mama would halve the squash lengthwise and scoop out the seeds. She’d fill the scooped out center with a thick pat of butter, amber maple syrup, and chopped pecans and roast the halves until perfectly tender. 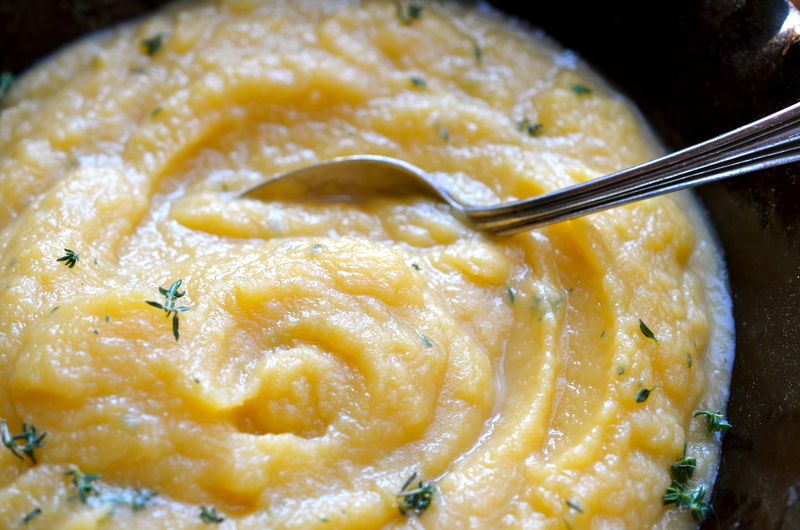 The buttery syrup would seep into the squash and create a magical mash, closer to dessert than a healthful vegetable. I’m still a huge fan of winter squash, although my recipes are now a bit less decadent. Winter squash are earthy, creamy, and rich – the definition of cozy comfort. 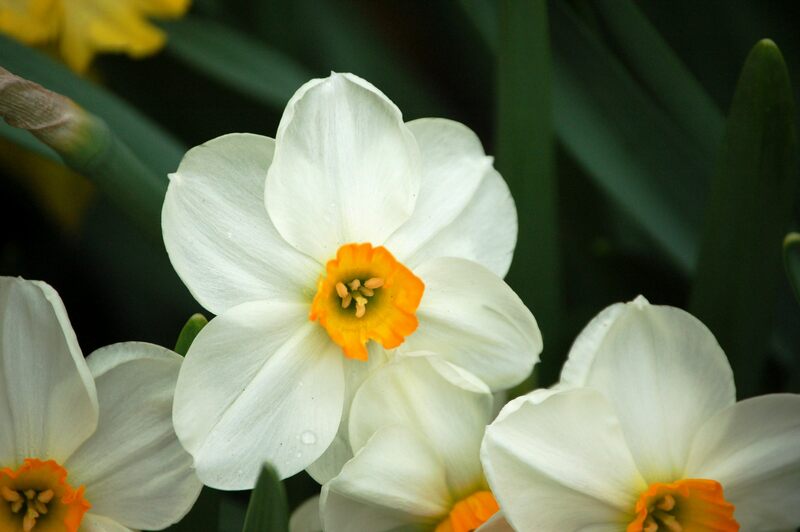 Many varieties are available year-round, but their natural season runs from late summer to mid-winter. Many people gravitate towards acorn squash because they are familiar with it, but there are many other flavors and textures. Sure, they are all quite similar, but just different enough that I want you to give them a try. 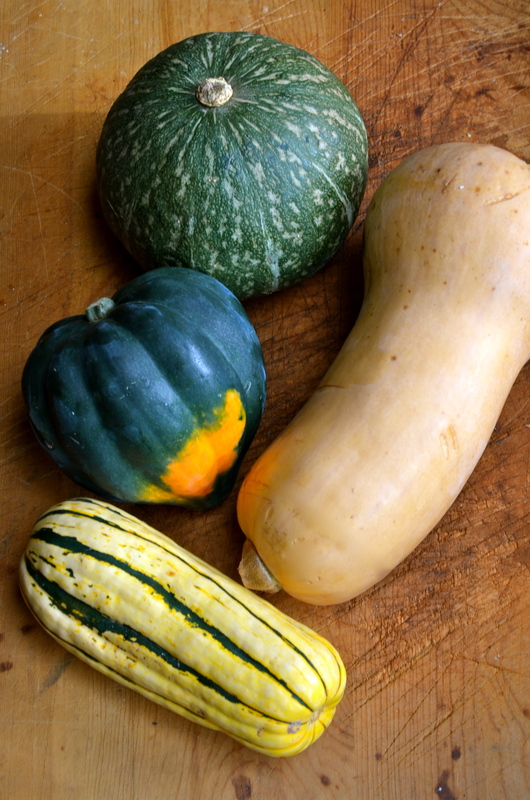 In fact, except for spaghetti squash, virtually any winter squash, including pumpkin, can be substituted for another in any recipe, from main dish to side dish to dessert. Here are a few of my favorites. 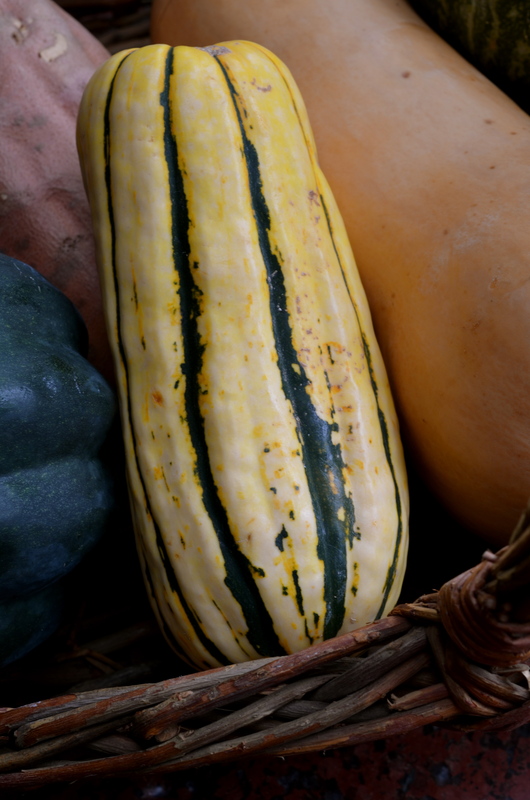 Delicata – Sweet and thin-skinned, this winter squash is quick cooking and very useful. The cream colored skin has dark green stripes in the ribs. My favorite way to cook this is to thinly slice it and roast it, seeds and all, to make delicata chips. Acorn – Sweet and nutty, the most common acorn squash are dark green in color, sometimes tinged with a bit of orange or yellow. The flesh is pale yellow and somewhat fibrous. As the name suggests, it is shaped much like an acorn. It has distinct ridges and a fairly tough skin, making it difficult to peel. Butternut – This is one of the easiest of all the winter squashes to work with because its smooth skin just pares away with a paring knife or vegetable peeler. Also, they keep well even once they have been cut upon – meaning, I shop for a large one, use what I need, and wrap the rest. It will easily last a week or so and can be carved on and be part of more than one meal. The long slender neck of the squash is perfect for cubing and I roast the bulbous end, skin and all, as in the recipe below. 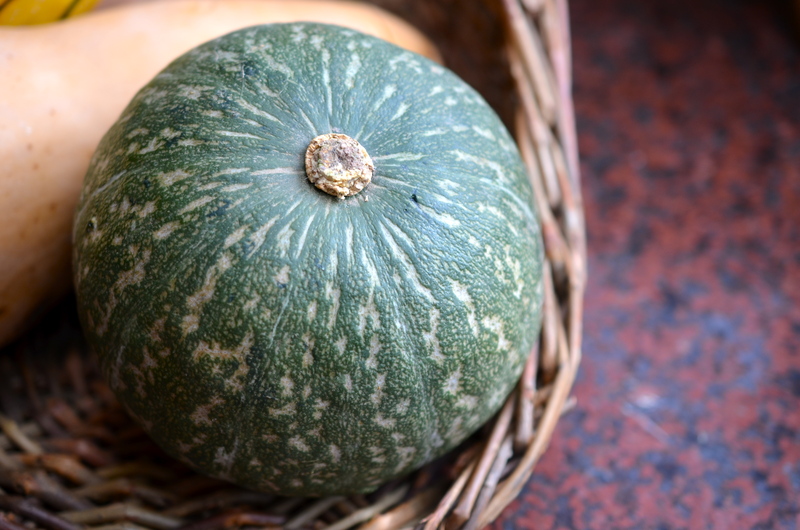 Kabocha – Kabocha is the generic Japanese word for squash. It has a green, bluish-gray streaked rind and the flesh is deep yellow. 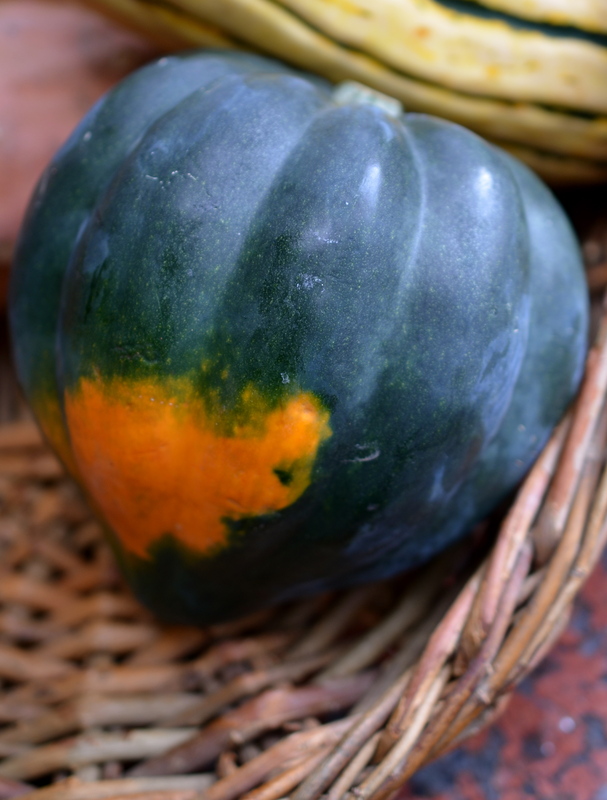 Kabocha squash has a rich sweet flavor, and can be a bit dry when cooked. The outer skin is pretty tough so follow my instructions for handling rutabagas to cut these hard-skinned squash. Speaking of comforting foods for winter weather, I am having a great time with my column on FoodNetwork.com called Down-Home Comfort. (You can follow the Down-Home Comfort feed on FN Dish with this link.) Stay tuned later this week for my Fried Chicken with Rice and Black Pepper Gravy! Heat the oven to 350°F. Brush a large skillet with oil and heat over medium heat. Add squash wedges without crowding and cook on both sides until mottled and browned, about 3 minutes per side. Transfer to a plate. (You will need to sear the squash in batches.) Repeat with remaining oil, squash, and onion. 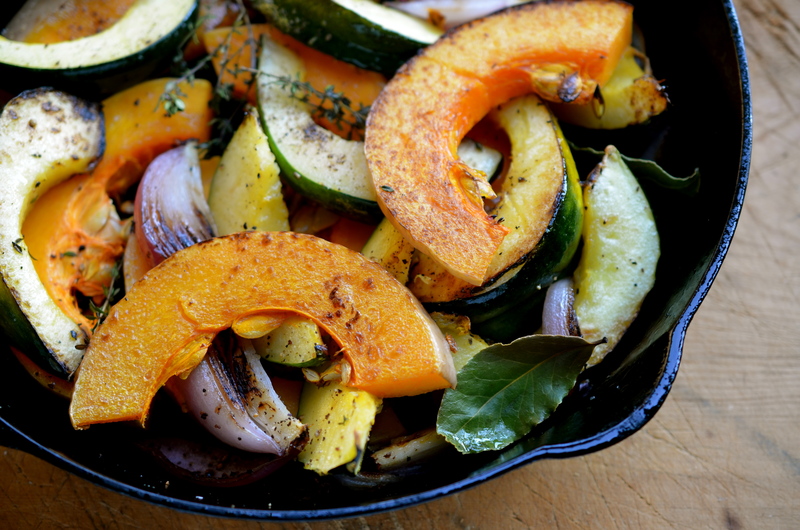 Return all squash and onion to the skillet and season with salt and pepper. Tuck the herbs about the skillet and transfer to the oven. Bake until tender to the point of a knife, about 35 minutes. Remove from the oven and drizzle over the maple syrup and sprinkle over the pecans. Return to the oven to warm the syrup and lightly toast the pecans, about 5 minutes. Remove the herbs and serve immediately. All Photos by Virginia Willis. Copyright © 2014 Virginia Willis Culinary Enterprises, Inc. Right about this time of year people are just starting to get a wee bit weary of root vegetables, winter squash, and bitter greens. Face it, after the romantic rush of collard greens kissed by frost and the seductive aromas of roasting roots, kitchen life can get a bit dull. Roots become a rut. Sweet potatoes are no longer nature’s candy. 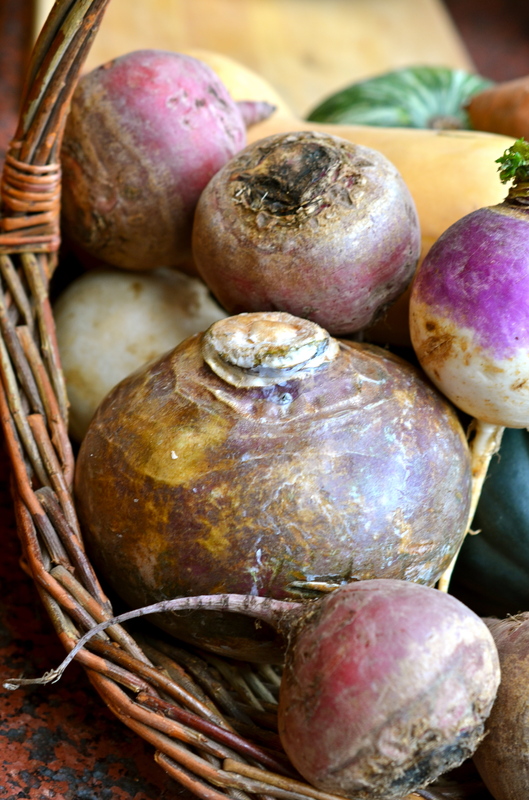 Face it, it’s a challenge to stimulate the senses — and your family — with a rutabaga. Even though I most often cook for two or more, there’s a recent new cookbook that offers a very refreshing look at vegetables and is guaranteed to spice things up. 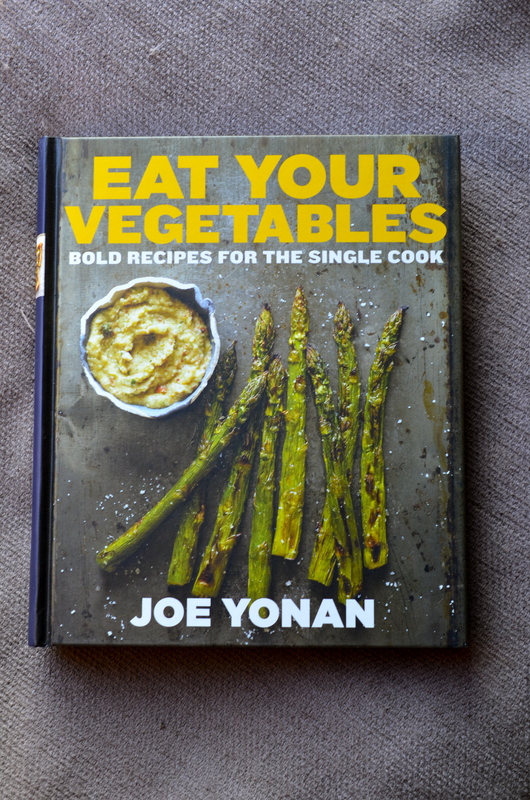 It’s called Eat Your Vegetables: Bold Recipes for the Single Cook by my friend and colleague Joe Yonan. 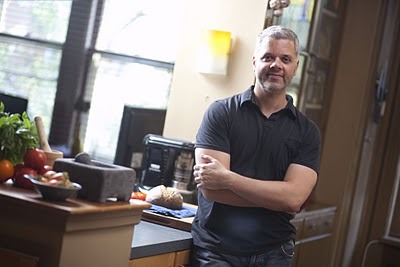 I adore Joe’s approach to food and cooking and featured his first book, Serve Yourself, in my blog a few years ago. He’s the food editor for the Washington Post. Check out his witty, smart piece on lentils. Mama loves him. She calls him “that handsome boy from DC”. Well, that handsome boy has written a great cookbook that you need in your kitchen. It’s perfect for anyone looking to expand their vegetarian and produce-based repertoire. The recipes are eclectic, flavorful, and yes, inspired. The ideas are fresh and out of the box. This cookbook will help you get more plants on your plate — even in the dead of winter. Yes, it’s a cookbook for cooking for one, but I’ve found the many of the recipes are very agreeable to scaling up or, as with the recipe I am featuring below, the portions are fine to share with one person. The main thing is that this book will help you think about cooking vegetables in a whole new light. Today, I am sharing Joe’s recipe from Eat Your Vegetables for a Sweet Potato Galette and just to prove these rustic roots can be rewarding, my recipe for a Revved Up Rutabaga Puree. I’m certain you will like them both. A safety note about knives – rutabagas are hard and dense, much like winter squash and celery root. I have found that the safest way to cut these tough vegetables is to press the chef’s knife against the vegetable, but do not force the knife through the vegetable. Hold the knife firm to the vegetable, and using your other hand, actually rock the vegetable back and forth into the knife. Try it. It’s a revelation. Please look for Shrimp and Grits in my column Down-Home Comfort later this week on FoodNetwork.com. I kicked off the series with Collard Greens & Whole Grain Cornbread and last week was Brunswick Stew. The response has been really great, so thanks for reading! Root vegetables, unlike green vegetables, need to start cooking in cold liquid, not boiling liquid. Place the stock, cubed rutabaga, and butter in a medium saucepan and season with salt and pepper. Bring to a boil over high heat then reduce the heat to simmer. Cook, uncovered and stirring occasionally, until the rutabaga is tender to the point of a knife, about 30 minutes. To make the puree, using a slotted spoon, transfer the cubes to the work bowl of a food processor fitted with the metal blade or the jar of a blender. Add the garlic and process until a smooth puree. If the mixture is too thick, add some or all of the cooking liquid, if necessary. If too thin, transfer to a clean saucepan and cook over low heat to evaporate some of the moisture. Add thyme leaves and pulse to combine. Taste and adjust for seasoning with salt and pepper. 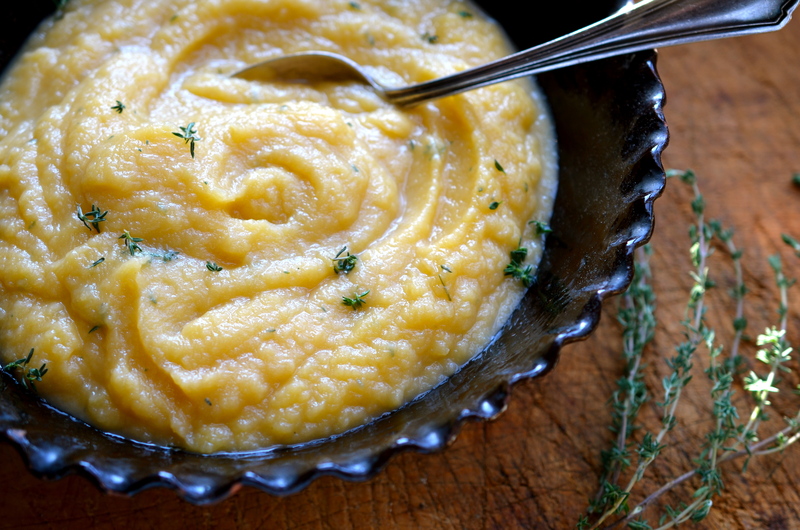 If needed, re-warm the puree over medium-low heat. Serve immediately. Preheat the oven to 400°F. Strip the kale leaves from the stems and coarsely chop the leaves. Thinly slice the stems and keep them separate from the leaves. Pour 1 tablespoon of the oil into a medium skillet over medium heat. When it starts to shimmer, sprinkle in the pimenton and let it sizzle and bloom for a few seconds, then add the onion, garlic, and sliced kale stems and sauté until tender. Add the mushrooms and sauté until they collapse and release their liquid, then add the kale leaves and continue cooking until the liquid has evaporated. Season with salt to taste and remove from the heat. 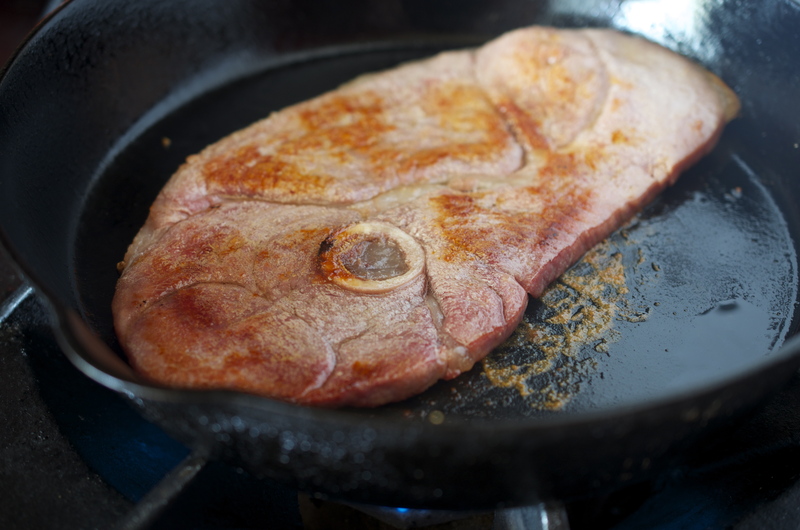 Pour the remaining tablespoon of oil into a small, well-seasoned cast-iron skillet over medium heat. Carefully arrange half of the sweet potato slices in the skillet in concentric circles, overlapping to form a couple of layers; sprinkle each layer with a little salt as you go. Spoon on the mushroom-kale mixture, and top with the grated cheese. Arrange the remaining sweet potato slices on top, sprinkling each layer lightly with salt as you go. Press the galette with a spatula, cover the skillet tightly with aluminum foil, and bake until the sweet potatoes are easily pierced with a fork, 20 to 25 minutes. 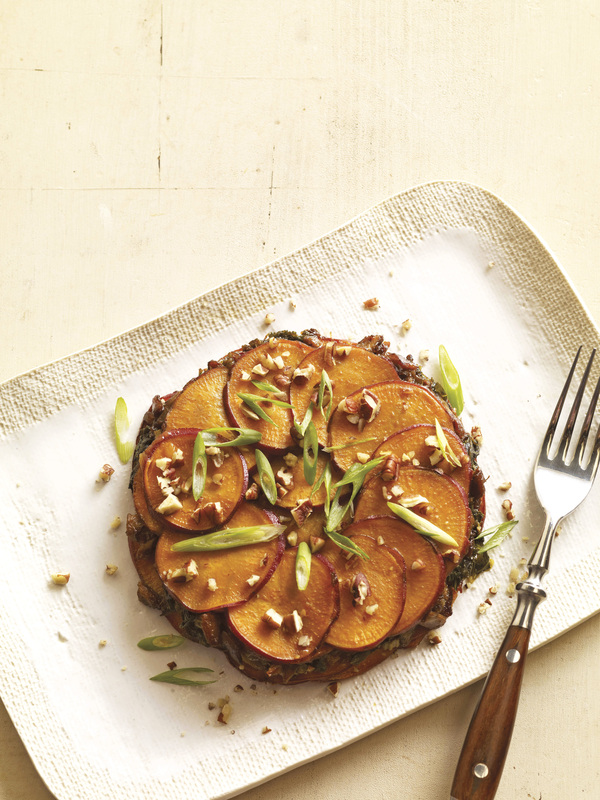 While the galette is baking, sprinkle the pecans into a small skillet over medium-high heat. Cook, shaking the pan frequently, until the nuts start to brown and become fragrant, a few minutes. Immediately transfer them to a plate to cool; if you leave them to cool in the pan, they can burn. Once they are cool, chop them. Remove the galette from the oven and take off the foil. Turn the oven to broil and slide the skillet under the broiler element or flame until the sweet potatoes just brown on top. Let the galette cool for a few minutes, then run a knife around the edges of the skillet to loosen it. Invert a plate over the skillet and, using oven mitts, hold the skillet and plate together and quickly flip the two so the plate is on the bottom and set it on the counter. Lift off the skillet. Some of the potato slices may stick to the pan; use a spatula to scrape them out and patch up the galette. I’m thrilled to announce that I have a new weekly column on FoodNetwork.com! It’s called Down-Home Comfort and will feature user-friendly, seasonal recipes that will make your mouth water! I am honored to be able to promote Southern food and cooking and ecstatic to be a part of presenting these foodways to a very broad audience. While I will certainly feature some classic, indulgent recipes like Fried Chicken and Macaroni and Cheese, I am very excited to show that Southern food is a living, growing cuisine, and not all Southern food is — or has to be — unhealthy. I kicked off the series last week with Collard Greens with Whole Grain Cornbread. 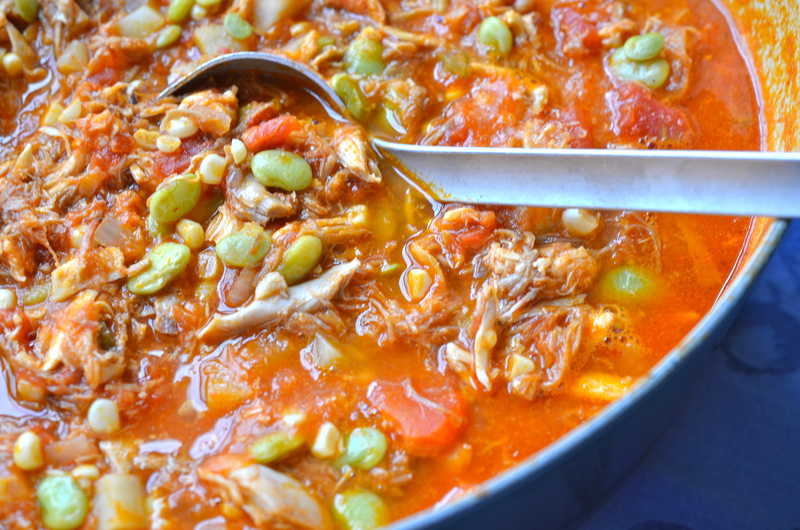 This week’s post is Slow Cooker Brunswick Stew— the perfect antidote to a Polar Votex. The other exciting piece of this is that I am shooting the photos, as well. I love learning and growing; it’s so exciting! Please sign up for the feed and stay tuned on Facebook and Twitter. I’m getting back on track with my own blog, so look for new posts in the next few weeks! In the meanwhile, please enjoy some Down-Home Comfort. I can’t describe how proud I am of this photograph. I’ve previously written about my admiration for my mentor and teacher, Anne Willan in a post titled The LaVarenne Way. 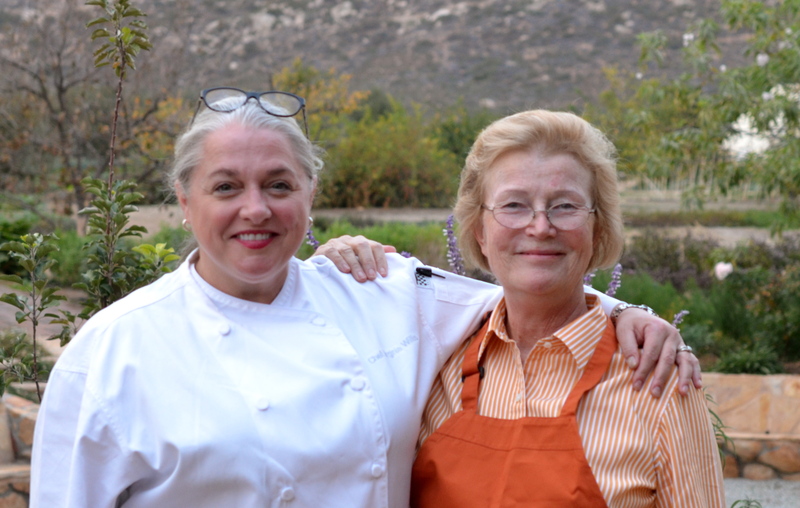 I was recently able to be her sous chef at Rancho la Puerta and it was such an honor and privilege to assist her, once again. She graciously insists we teach together, but I know better. I may be an accomplished chef and food writer, but with Anne I am the constant student. She’s had an amazing career and each and every time I am in the kitchen with her I learn something. 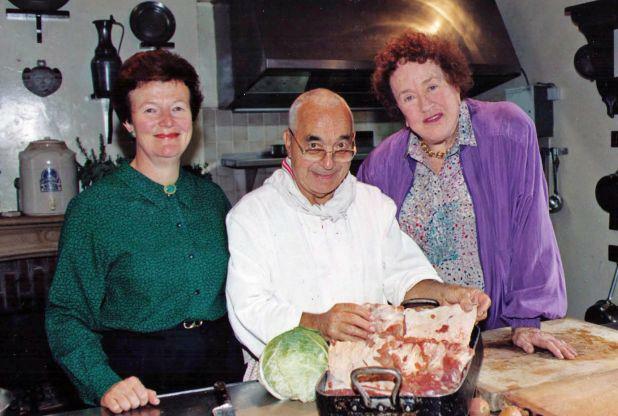 I admit I take it personally when folks don’t realize what an enormous contribution Anne has made to the world of food, cooking, and food-writing — or even sometimes who she is. Those who are in the know are also in awe. 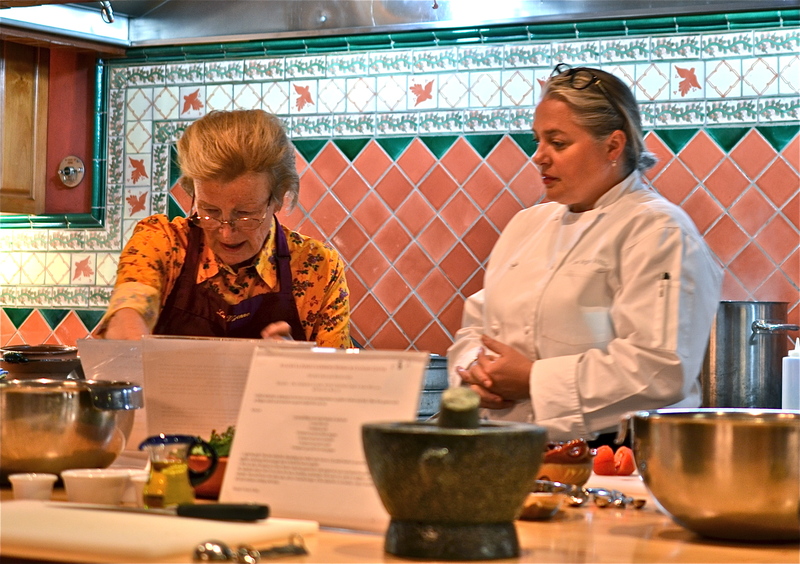 In May, Anne was inducted into the James Beard Foundation’s Cookbook Hall of Fame for her body of work, which includes 40 cookbooks and a 26-part PBS program. The list of LaVarenne alumni goes on and on — Amanda Hesser, Alex Guarnaschelli, Tanya Holland, Steve Raichlen, Kate Krader, and Gale Gand are just a few. All those folks may be in media and on TV, but that’s the thing, Anne is, as one review stated, “not the next Food Network Star.” Indeed, she is not, but without her there wouldn’t be one. Anne’s latest book is her memoir called One Soufflé at a Time. In it she documents her wonderful, wondrous life in food. It’s peppered with stories of smuggling truffles, as well as the birth of LaVarenne Pratique, the culinary masterpiece that was eventually translated into 9 languages and sold over 1 million copies. (It’s out of print and much sought after on e-bay. However, it will be available as an e-book soon. Make sure to “Like” Anne Willan on Facebook to hear about the release. Born and raised in England, she attended Oxford University and graduated with a degree in Economics. Her scores were not stellar and her father suggested she attend secretarial school. Instead, she thought she’d do something different and studied at Le Cordon Bleu. She went on to cook for the Van der Kamps at Chateau de Versailles where she cooked for British royalty, French aristocrats, and Heads of State. She later became the Food Editor for the Washington Star and an editor for Gourmet Magazine. 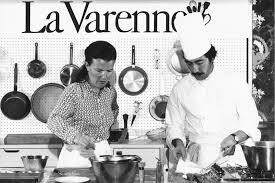 In 1975, encouraged by her dear friends Julia Child and James Beard, she founded the Parisian cooking school LaVarenne, the first bilingual French cooking school in Paris. Whether you recognize her name or not, Anne Willan and LaVarenne were hugely impactful in popularizing French cuisine to the American public. She demystified classic French culinary technique for regular people who love food. Her recipes and instructions are clear and direct, much like Anne. I have to be honest and admit I haven’t quite finished it. I’m savoring it like a French buttery sablé, enjoying bits at a time, sneaking reads in between a slew of deadlines. In it I hear Anne’s clear, strong voice and I feel like I am the constant student, joyfully learning once again. In honor of Thanksgiving, I wanted to share Anne’s recipe for Moroccan Roast Turkey found in One Soufflé at a Time. I actually originally tested this recipe as an editorial assistant — over 15 years ago for her cookbook Cooked to Perfection. It’s positively delicious and like much of Anne’s work, has stood the test of time. If you’re wanting to try something a little different this Thanksgiving week, I can’t think of anyone else to trust. 1. Heat the oven to 350F and set a shelf low down. Spread the chopped almonds and sesame seeds in a single layer in a shallow pan and toast them in the oven, shaking the pan occasionally, until golden, 8-10 minutes. Set aside to cool. Leave the oven on. 2. In a small bowl, mix the ground cinnamon, cumin, coriander, ginger and cloves with the salt and pepper. Rub both the skin and cavity of the turkey with the spice mixture. Set the bird on its back in a roasting pan and spread the skin with softened butter. Put the whole onion inside the turkey and tie it in a neat shape with string. Warm the honey and half the stock in a small pan and pour this over the bird. 3. Roast the turkey in the heated oven until it is golden brown all over and the meat starts to shrink from the drumsticks, 2 1/2-3 hours. During cooking, turning it on one side, then the other, and finally returning it to its back. The turkey is done when you lift it with a two-pronged fork, juices from the cavity run clear, not pink, and when you rotate a drumstick it will feel pliable not rigid. During roasting, baste the bird often and, when the juices begin to brown, add the remaining stock. Dilute with more stock towards the end of cooking if needed as that the honey scorches easily. 4. About 15 minutes before the turkey is done, take it from the roasting pan and strain the pan juices into a small saucepan. Skim off the fat and boil the juices to reduce them if necessary — there should be about 1 cup/250 ml of this glaze. Stir in the toasted sesame seeds and almonds. Return the turkey to the roasting pan, spread the glaze over the top, and continue roasting, basting very often, until the skin is dark golden brown and crisp, 10-15 minutes. 5. Transfer the turkey to a carving board or platter, cover it loosely with foil and let stand 10-15 minutes. Before serving, discard the strings and onion from the cavity. Buy Grits by Short Stack Editions. And, if you buy any of my books from your independent bookstore or online, I’ll be happy to send you a signed bookplate! Please keep up with me on Facebook and Twitter. Copyright © 2013 Virginia Willis Culinary Enterprises, Inc. Author of Bon Appétit, Y’all and Basic to Brilliant, Y'all. Grits Missionary and Bourbon Devotee.